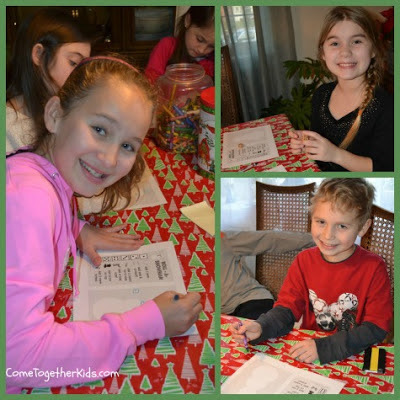 Here's the last of our activities from our Cousins Christmas party and the one that the kids thought was the most fun. After everyone played the Roll-A-Snowman game and enjoyed their Snowman Sundaes, I got the supplies ready for this super silly activity. You could also add hats or other snowman accessories. The kids paired up so there was one "builder" and one "snowman". (You could easy do it in larger teams too). I gave each team a fresh roll of toilet paper, 3 circles with a piece of tape on the back, a triangle nose also with tape, and a scarf. They had to use up the whole roll of toilet paper to wrap up their partner like a snowman, then tape on the buttons, wrap on the scarf and finally tape on the nose. We did it loosely as a race to see which team was finished first, but really it was just for fun. 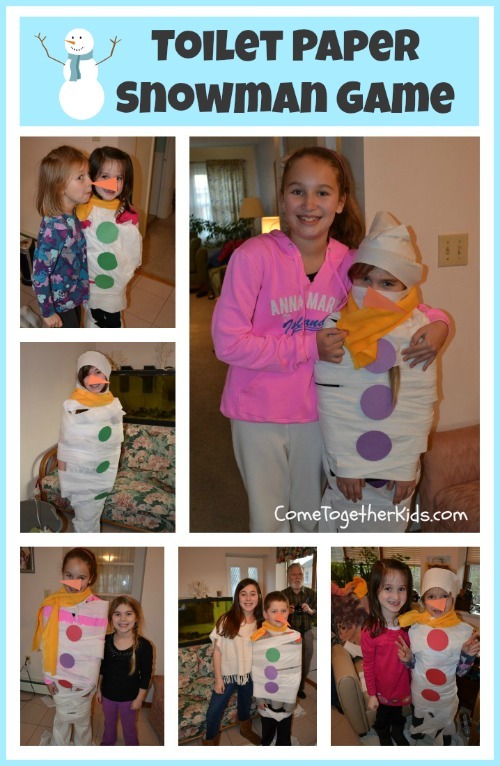 After all the snowmen were complete, the kids had fun ripping off all the toilet paper. Then I gave each team a fresh roll and the other person got the chance to be wrapped up and transformed into a snowman! Here's a cute and yummy little treat for the Winter months. 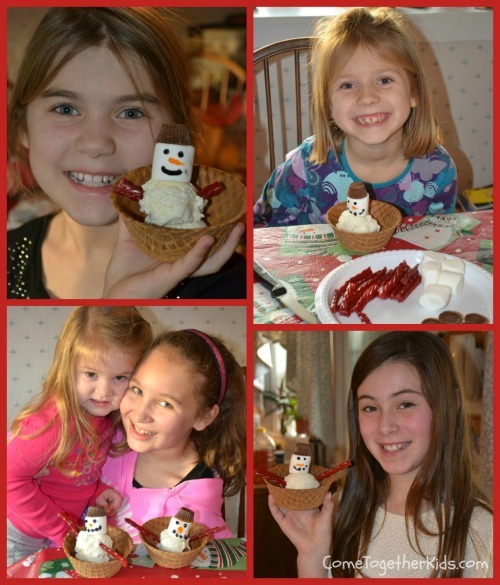 We made ours at our Cousins Christmas party. 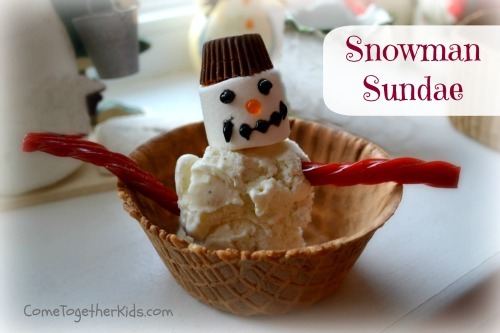 So simple, just put a scoop of ice cream into the bowl and let the kids add the snowman's features. Stick in the Twizzler arms, draw a face on the marshmallow with the gel icing, stick on some chocolate chip buttons, add the Reese's cup hat and then ENJOY! I just printed out 8 copies and gave each child a die to roll and some crayons. To keep the pace even, I just had them all roll their dice, follow the directions, then wait till everyone else finished. Then, I'd tell them to roll again, add the feature, and wait a few seconds for everyone to finish again. If they rolled a number they'd already used, they didn't draw anything for that turn. (You could also play it so you just keep adding the features, even if you already rolled that number, and end up with snowmen who have 3 noses and 4 hats!) When the kids rolled all the numbers and completed their snowmen, they got to go into the other room to make their own Snowman Sundaes. It was a pretty quick activity, but they all enjoyed it. For the most part, I don't use a lot of Martha Stewart's ideas. 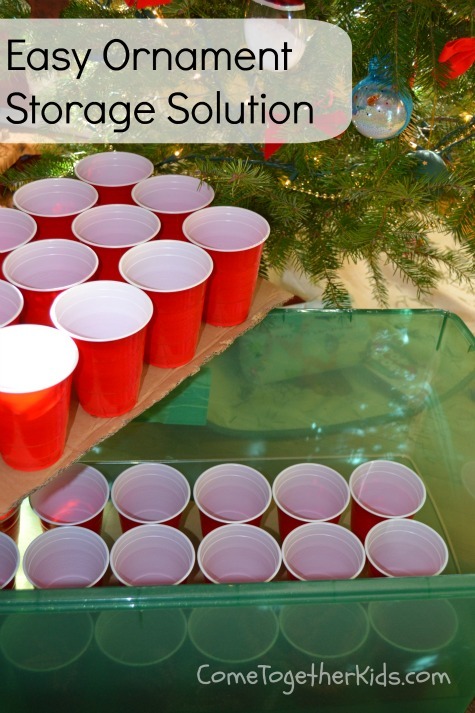 I think she's a very creative woman with lovely projects, but I just don't have much need for a fancy centerpiece when our table is usually set with mismatched cups and plastic plates. However, when I came across this idea for ornament storage on Pinterest, I knew that it was a Martha Stewart tip I would actually use. Before I took down our Christmas tree the other day, I got my supplies ready. Pretty smart, isn't it? I already had the large storage box, but the flimsy little cardboard dividers it came with were pretty much worthless. I just cut two pieces the same size as the storage bin from a large cardboard box, then hot glued on some plastic cups. 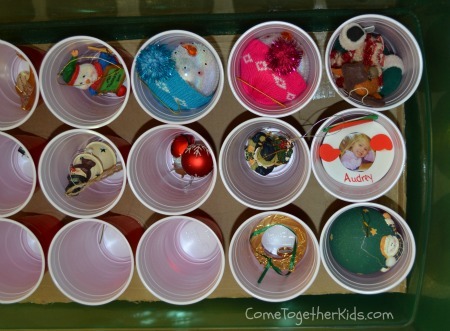 As I took the ornaments off the tree, I put them into the plastic cups, filled up one layer, then added the second piece of cardboard and cups!